From a drugstore operator that has become one of the market's biggest winners over the past five years stepping up for its quarterly report to the world's most valuable consumer tech-giant making its new smartphone available, here are some of the things that will help shape the week that lies ahead on Wall Street. The new trading week kicks off with Analogic (ALOG) reporting quarterly results. The provider of medical imaging and aviation security solutions is expected to take a step back when it chimes in after the market close. Analysts see Analogic's revenue and earnings per share declining by 10 percent and 19 percent, respectively. It could be worse. Analogic has clocked in below Wall Street's profit targets in each of the three previous quarters. That's not a good trend, and it explains why Analogic is trading closer to its 52-week low than its 52-week high. Adobe (ADBE) is the undisputed champ when it comes to desktop publishing. Its Photoshop photo-editing software and PDF-authoring Acrobat are industry standards. Growth has slowed as the public takes to cheaper cloud-based alternatives, but Adobe is still expected to top $1 billion in revenue when it reports on Tuesday. One of the best bellwethers for the state of corporate America steps up on Wednesday morning with its latest quarterly report. FedEx (FDX) is a great measuring stick for the health of the business economy. If companies are doing well enough to want to rush important documents -- and if consumers are picking up the pace of online sales -- it should manifest itself in FedEx's report. 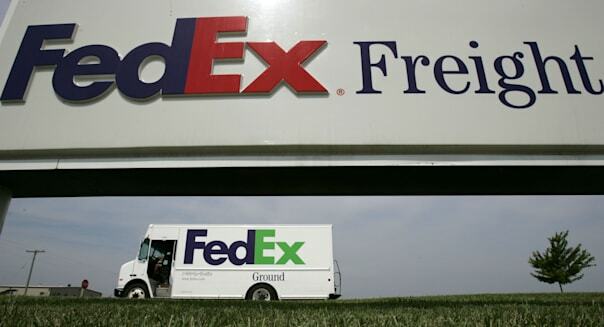 Analysts see modest growth at FedEx. The pros see revenue climbing 4 percent for the quarter and 5 percent for the entire fiscal year that began in June. Rite Aid (RAD) has been one of the market's more remarkable turnaround stories. Five years ago, the drugstore operator was on the brink of bankruptcy. The stock bottomed out at 20 cents a share. It was mired in losses. Things have started to turn around over the past couple of years, and Rite Aid has now come through with seven consecutive quarterly profits. Rite Aid will get a chance to stretch that streak to eight quarters when it reports on Thursday. Analysts see it happening. Shareholders who were fortunate enough to snap up shares of Rite Aid at 20 cents in 2009 have seen their stake appreciate 30-fold in five years. Apple (AAPL) finally unveiled the larger iPhone 6 and the even larger iPhone 6 Plus a few days ago, and come Friday the new smartphones will hit the market. Apple is opening up its stores at 8 a.m., though long lines await those who weren't able to preorder their handset on Sept. 12. This is Apple's response to the Android devices that have captivated consumers with their larger screens. Apple hopes that the larger displays coupled with an improved camera and chips will help accelerate the growth of iPhone sales. Motley Fool contributor Rick Munarriz has no position in any stocks mentioned. The Motley Fool recommends Adobe Systems, Apple and FedEx. The Motley Fool owns shares of Apple. Try any of our Foolish newsletter services free for 30 days. Check out our report on where the real money is to be made from the just-announcedApple Watch. Although summer isn't officially over until Sept. 23, most people consider summer a done deal at the end of August. As such, summer gardening season comes to a screeching halt and seeds, flowers and other gardening goods aren't as popular of a purchase. "Nurseries want to offload their inventory before the official end of summer," explains Tran. "We've seen markdowns ranging from 20 percent to 75 percent off." The iPhone 6 release date is scheduled for early September, which means several things. First, the older models -- even if they've never been opened -- will instantly lose some of their value as they're deemed "old news." It also means that pre-owned iPhones will hit the used market as consumers trade in their goods for the latest version. According to data by NextWorth, iPhones drastically lose their value six weeks before the new phone launches and hit their lowest price at the time of the launch. This low price remains steady through the end of the year. If there's one thing we know for certain, it's that denim will never go out of style. It's especially on trend throughout the fall, though, as it keeps you warm, comfortable and fashionable. "Hot tag" prices on denim also serve as a way to get shoppers in the door to buy other cool-weather duds that, most likely, aren't on sale. Most shoppers have already purchased their new patio furniture, decor and grills for the year. In fact, many are already thinking about putting them into storage, which is why all outdoor furniture, umbrellas, lighting, grilling supplies and similar merchandise is being put on clearance. "Look for markdowns in the 60 percent to 75 percent range as retailers clear room for next season's merchandise," says Charles Tran, founder of CreditDonkey.com. While discounts may deepen as the month goes on, there will be less to choose from, so plan accordingly. At the beginning of every school year, you can pretty much count on retailers going into panic mode as they realize they have way too many pens, erasers, folders, pencils and other school supplies left over from the back to school rush. Their plan? A sale, of course. Tran says that savings will generally fall into the 25 percent to 75 percent off range for these excess school supplies. Consider stocking up on items you may need throughout the year, or buy items you can use at the beginning of the next school year. Just as grilling and gardening wane at the beginning of summer, so does bicycle riding. Even if you're not planning to ride a new bike in the coming months, it's a wise investment to make if you foresee yourself needing one for next spring. Expect to find slashed prices on bikes for riders of all ages at both online and local stores. We're not saying you should run out and buy a car just for the heck of it. That said, if you need a new vehicle, shopping around now is a wise idea. ConsumerReports says that next year's models hit the car lot in late summer through fall, which means 2014 models are appropriately discounted. Make sure you get the best price. It may seem overkill to plan your Thanksgiving and December holiday adventures in September, but your wallet will thank you for doing so. The best time to buy plane tickets is six to eight weeks in advance for domestic flights, and 11 to 12 weeks in advance for international flights. To ensure you snag a good deal, sign up for price alerts and airline emails on specials and price decreases. In addition to shopping around for your plane tickets, BankRate.com says that "several industry experts recommend booking your car as soon as possible." You can also save money when booking things together, such as a hotel, car and flights.